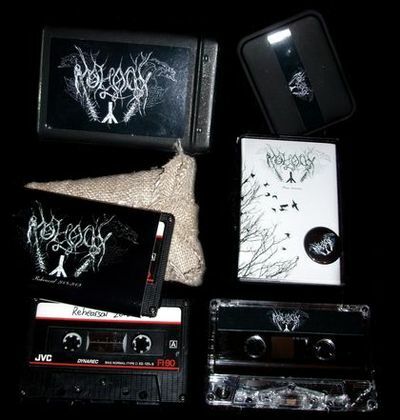 Metal boxsed set released via Depressive Illusions Records (Ukraine) in 2010 and limited to 9 copies only (copies 1 & 2 have a different metal box). Metal box handpainted in black color with logo sticker on it, includes: 2 audio cassettes ( 1"old style" black tape "jvc" or "basf" with handwritten words on it, packed in pro-printed package and ancient sackcloth + Cassette with one sided cover printed on photo paper in plastic case with black vinyl stickers) and 1'inch logo pin. Almost all copies were sold in Japan. - "Rehearsal 2008-2009" (Includes rehearsal Dark Ambient session recorded between 2008-2009). - "Promo 2009-2010" (Side A includes tracks taken from upcoming at that moment album 2009 “Der Schein des schwärzesten Schnees ”. Side B includes tracks from upcoming at that moment full-length 2010 “Isolation der Essenz”, where track "Depressive Visionen eines sterbenden Horizonts"is a rehearsal version without screams).